Englewood is located at 39°38′49″N 104°59′31″W﻿ / ﻿39.64694°N 104.99194°W﻿ / 39.64694; -104.99194 (39.646837, -104.991986). 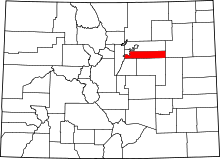 The city is 5,371 feet (1,637 m) above sea level, higher than Denver. According to the United States Census Bureau, the city has a total area of 6.6 square miles (17 km2), of which, 6.6 square miles (17 km2) of it is land and 0.1 square miles (0.26 km2) of it (0.76%) is water. 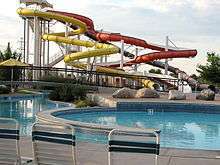 Englewood features a climate very similar to that of Denver, but is slightly milder and more stable due to the city's establishment in a very low part of the South Platte River valley. Winds are very sparse throughout the city. The Köppen Climate Classification system labels Englewood as having a cold semi-arid climate, abbreviated as BSk. As of the census of 2000, there were 31,727 people, 14,392 households, and 7,469 families residing in the city. The population density was 4,843.8 people per square mile (1,870.2/km²). There were 14,916 housing units at an average density of 2,276.4 per square mile (879.3/km²). The racial makeup of the city was 71.8% White, 17.5% African American, 1.3% Native American, 1.9% Asian, 0.1% Pacific Islander, and 2.5% from two or more races. Hispanic or Latino of any race were 13% of the population. In the city the population distribution was varied, with 20.3% under the age of 18, 9.6% from 18 to 24, 35.9% from 25 to 44, 20.0% from 45 to 64, and 14.2% who were 65 years of age or older. The median age was 36 years. For every 100 females there were 98.1 males. For every 100 females age 18 and over, there were 96.4 males. The median income for a household in the city was $38,943, and the median income for a family was $47,290. Males had a median income of $32,636 versus $28,480 for females. The per capita income for the city was $20,904. About 4.9% of families and 8.2% of the population were below the poverty line, including 9.0% of those under age 18 and 7.5% of those age 65 or over. The Federal Correctional Institution, Englewood is named after Englewood, but is not in proximity to Englewood. It is in unincorporated Jefferson County. The City of Englewood is served by the Englewood Public Schools (EPS), a district with two high schools, Englewood High and Colorado's Finest Alternative High School. 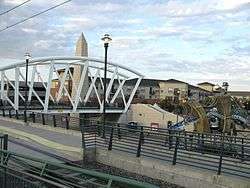 Small parts of the city are served by the Littleton Public Schools and the Sheridan Public Schools. There are two middle schools: Englewood Middle School and Englewood Leadership Academy. There are four elementary schools: Bishop, Clayton, Charles Hay and Cherrelyn. Some of neighboring Cherry Hills Village is within the Englewood School district. The city is also home to a number of private schools, including the Saint Louis School, a large Catholic K-12 institution. Also, the city used to host the Denver Seminary, an evangelical graduate-level religious school that has since relocated to Littleton. The former seminary site is now slated for redevelopment. 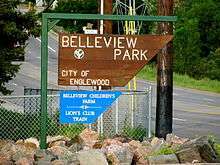 The place name "Englewood" is assigned to three ZIP codes(80112, 80112, 80113) which cover areas adjacent to the city on the west and east, and an area southeast of the city that is much larger than the city itself. Thus, many addresses written as "Englewood, Colorado" are actually in the Arapahoe County cities of Sheridan, Cherry Hills Village, Greenwood Village, or Centennial; or in Meridian in unincorporated Douglas County. This area includes part of the Denver Tech Center and the surrounding commercial development along the I-25 corridor, which is often erroneously attributed to Englewood; the city actually lies several miles west. Notable individuals who were born in and/or have lived in Englewood include missionary and archaeologist David Crockett Graham, civil rights activist Carlotta Walls LaNier, and railroad executive Louis W. Menk. ↑ "2014 U.S. Gazetteer Files: Places". United States Census Bureau. July 1, 2014. Retrieved January 6, 2015. 1 2 "Active Colorado Municipalities". State of Colorado, Department of Local Affairs. Retrieved 2007-09-01. 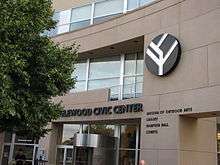 ↑ "City of Englewood: City Council". City of Englewood. Retrieved 2007-09-12. ↑ "Chronology of Englewood's History". 2005. Retrieved 2009-06-16. ↑ "Annual Weather Averages for Englewood, CO". 2009. ↑ "Best Hospitals - US News and World Report". 2009. Retrieved 2009-06-16. 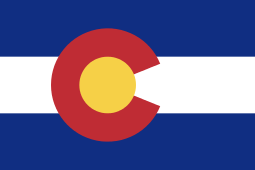 ↑ "Englewood (city), Colorado Quick Facts from the US Census Bureau". 2009. Retrieved 2009-10-18. ↑ Jones, Rebecca. "Article: PRISON HAS A FIELD OF VISION.(Spotlight)." Rocky Mountain News. May 2, 1999. Retrieved on July 28, 2010. "You're talking about the Englewood Federal Correctional Institution - which, interestingly, is nowhere near Englewood, but that's the federal government for you. (It has a Littleton mailing address, as does most of south Jefferson County, though it's nowhere near Littleton, either, but that's a wacky question for another day.)" ↑ "FCI Englewood Contact Information." Federal Bureau of Prisons. Retrieved on July 28, 2010. ↑ Brown, Jean Graham (1993). "Graham, David Crockett and Alicia May (Morey)". In Altenbach, Roy and Ethel, and The Englewood Historical Society. A History of Englewood, Colorado. Dallas: Curtis Media Corporation. pp. 325–326. ISBN 0-88107-228-1. ↑ "Carlotta Walls LaNier (1942- )". The Encyclopedia of Arkansas History & Culture. Central Arkansas Library System. Retrieved 2016-04-18. ↑ "Louis W. Menk". National Railroad Hall of Fame. Retrieved 2016-04-18.